Despite the onslaught of departmental stores and malls in Indian towns and cities, one can still find vendors selling fruits and vegetables on the bylanes, streets, on highway roadsides and from home to home. Seasonal fruits and vegetables are sold fresh from the farm. I’m a huge fan of buying produce from such folks. The warmth of personal exchanges replaces the mechanical response you get from uniformed store assistants. Plastic wrapped boxes of fruit sitting on the shelves in the air-conditioned environment of huge stores simply fails to allure my heart. The other day I had the charming experience of interacting with a simple village woman who comes to the city everyday to sell local and seasonal produce. She was trying her best to convince us to buy the last mangoes of the season. Being abandoned by her only son she found happiness and income for living by selling produce. It is time to bid a temporary adieu to my favourite fruit, the mango. It is just out of season here in India and I already cant wait for it to start appearing next year. 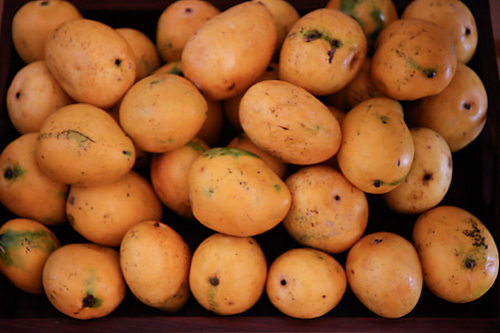 I crave fresh seasonal mangoes through the year. I squeal in delight each year when "Iqbal bhai", my mango supplier in Mumbai gives me a call sometime in March to announce the arrival of the “king of fruits”. One afternoon, when I was sitting with my grandmother with a cup of rooibos, I saw the last few mangoes that were remaining and wondered what to do with them. 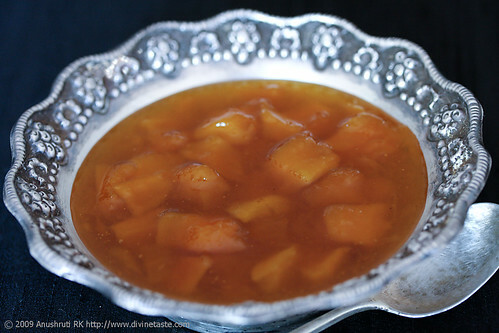 I suddenly remembered the taste of this mango preserve from my childhood and urged my grandmother to show me how she made her exotic “gulamba”. This way I could relish the taste of the mangoes for a few more weeks. My ever-enthusiastic grandmother obliged and the result was juicy succulent pieces of mangoes in gooey mango flavoured sugar syrup. 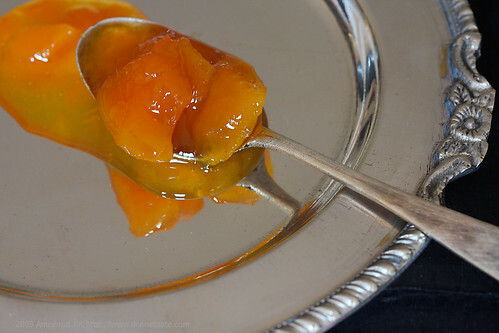 If you ever happen to try this mango preserve, I promise you, you wont be disappointed. Sending the main photo to Click, a monthly photography event hosted by jugalbandi, where the theme for the month of July's contest is Bi-colour. This preserve is best prepared with alphonso mangoes. Place the sugar and water in a wok or a saucepan over a medium flame and keep stirring until the sugar dissolves completely. 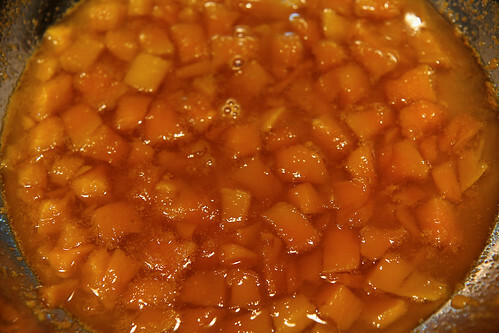 When the sugar dissolves and the syrup starts to simmer, add the mangoes and boil for 10 minutes on a medium low flame. After it cools down, transfer to a clean air-tight container and store in the refrigerator. Can be stored for about 4 weeks. Mango gulambo sounds a good way to enjoy mangoes even after their season is over, i bet it would taste yummy with rotis or idli and dosas! Mmmm.. sounds very tempting… wonderfuls clicks.. gud job !! First time here. I do not know how I missed your site. Pretty pictures! Ah, loveliness that lady! I love her smile. How we take little things for granted, nostaligia time. Hi, I am a regular reader of your site and eagerly look forward for your posts. Really love the presentation..
Divya: Glad you enjoy reading my site. You can get rooibos in India. They can courier it to you anywhere in India. Hi mum, I want to do a multi million dollar project on mangoes, in my part of the world, Ghana, W/A. we have a lot of mangoes here which are left to spoil for nothing. 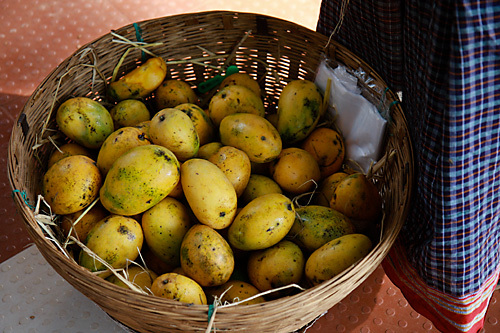 I want to know an economic way of preserving the entire mango fruit for about two months or three. I can Sell 2 for one dollar @ that time. cant we preserve mangoes how apples are done. please help me to implement my project. Hi,Just came across ur blog must tell u its absolute pleasure to know u and ur lovely receipes, being foodie myself.Thanks for giving contact for rooibos, had been on search for quite sometime in Bangalore. 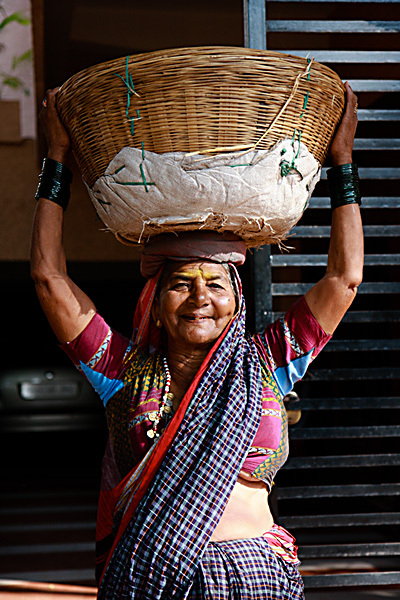 That picture of the mango vendor is fantastic – you've captured both the earthy and soulful aspects in the portrait. The light illuminating her, the bronzed skin, the wonderful traditional attire, bangles, the generous spirit blossoming in her smile inspite of the hard work and poverty her patched basket shows…salt of the earth, unforgettable. Mangala: Great observation! Ans thanks for your appreciation! this is not gulmba recipe its sakharamba recipe..in gulamba we use gud (jaggery) name itself suggest that!! mishka: What you are saying makes sense. But, in Indian cuisine jaggery and sugar are used interchangeably in many dishes. The Tamil sakkarai pongal (sakkarai meaning sugar) is a dish which uses only jaggery. In our family we call this gulamba whether it is made with sugar or jaggery.